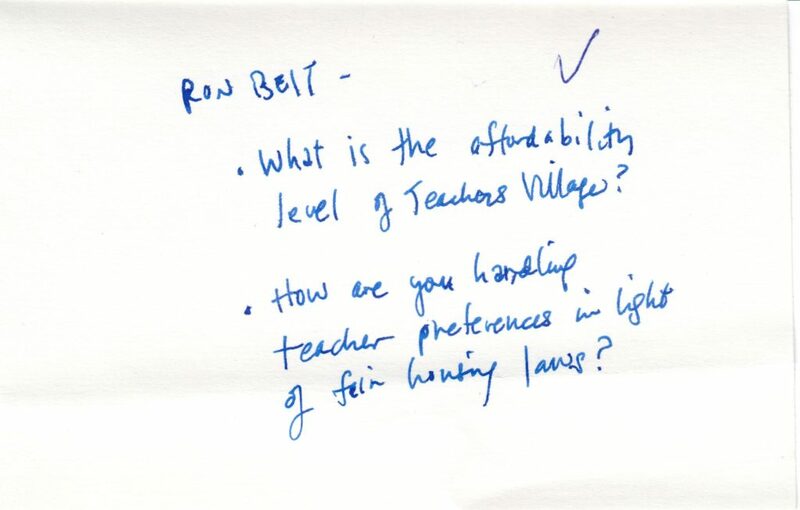 Ron Beit discusses how it is possible to accommodate teachers housing and more without running afoul of federal fair housing rules. He cautions that a thorough understanding of state and local rules is necessary, but that it is possible to be creative in building houses. He emphasizes an all of the above approach to housing and encourage disparate public agencies to work together and work with private partners. The panel organizers, Ken Pyle and Kirk Vartan, close the evenings event with a brief discussion of a now passed resolution by Supervisor Chavez that “Directs Administration to explore affordable housing opportunities with community college districts.” This 6-month window is an opportunity to explore how the community college districts and county can bring their respective assets together to help address the housing crisis.